Siskin Hospital volunteer Carolyn Raborn has earned an instructor certification in Wheelchair Tai Chi, one of the most popular and effective mind-body healing arts for people with limited mobility. Ms. Raborn, a paraplegic from an automobile accident and former Siskin Hospital patient, has attended Tai Chi classes for more than eight years. In 2008, she participated in a pilot study at Siskin Hospital performed by a group of UTC School of Physical Therapy researchers, led by Dr. Zibin Guo, a medical anthropologist and Tai Chi master. Dr. Guo developed the Four Moves of seated Tai Chi form which is structured according to the needs and characteristics of people with ambulatory difficulty. Results from the eight-week study suggested seated Tai Chi plays an important role in improvement of physical condition, including mobility and pain reduction. When the study ended, Ms. Raborn and her fellow participants pressed for a weekly Tai Chi class at the Siskin Health & Fitness Center, which Ms. Raborn has been attending ever since. Encouraged by her own physical improvement and Siskin Hospital staff, she decided to pursue instructional certification, offered here in Chattanooga by Dr. Guo. 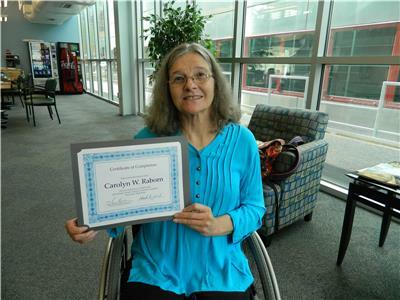 Ms. Raborn often visits new spinal-cord injured patients at the Hospital and she says they almost look relieved to see someone in a wheelchair coming in to see them. Tai Chi, a centuries-old healing art, generally consists of 24 postures. Dr. Guo designed the Wheelchair Tai Chi Instructor Training Workshop to include 13 postures for those with ambulatory limitations. His program subsequently debuted at the 2008 Paralympics. To learn more about the Tai Chi Program at the Siskin Health & Fitness Center, call 634-1234 or visit www.siskinrehab.org.